With temperatures cooling in the Fall, plants and grass won’t require as much supplemental water, plus Fall rain will help do the job for you. Most homeowners don't scale back on their irrigation schedule regardless of the change in weather, resulting in lawns being overwatered. Overwatering in this kind of weather causes conditions for fungal diseases such as Brown Patch to set in. Brown Patch in St. Augustine lawns looks like circular patches that are brown, yellow or tan in color. In shorter-cut lawns, such as Bermuda grass, the patches tend to be orange or brown. In both types of grass the leaf blades affected by Brown Patch will have tan lesions (spots) with a dark brown border. To avoid Brown Patch cut back on watering levels in your lawn in fall and winter. If you’ve been watering in the evening, be sure to switch to an early morning watering schedule because water that sits on your lawn overnight is a breeding ground for fungus. Lawns still need some supplemental water in fall and winter, but not nearly as much as they need in summer. Texas A&M Horticulture has published some valuable tips about how to avoid 'Brown Patch" and protect your lawn during the vulnerable months. 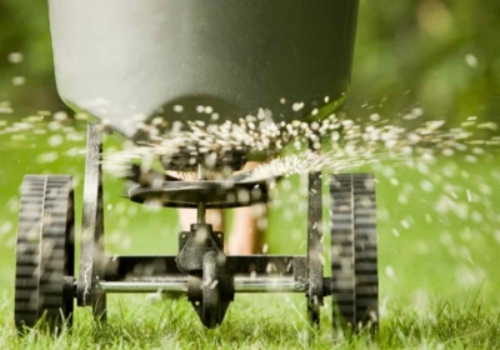 Fertilizing your lawn at the right time will help to develop strong roots and and overall plant health, which means less damage from disease. Click here for "Feeding your Lawn" tips and advice. Living Expression Landscapes can diagnose and treat infections of Brown Patch for you, as well as other plant diseases, if you notice symptoms. We can also properly fertilize and maintain your lawn, aerate your soil, and install/service all irrigation systems to create a healthy lawn for you all year-round. Give us a call for a consultation today!